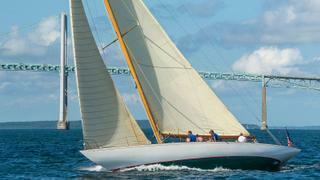 Together with her late husband, DuPont restored the 1921 yacht Pam. I met Bob Tiedemann on July 10, 1991. He walked into my sales office at the Sheraton Hotel on Goat Island and invited all of us out for an evening sail on Gleam, his 12 Metre. Three years later on the exact date, we married on the bow of Gleam. Before I met Bob I sailed in small boats; I went from a 4.2 metre boat to a 20.7 metre – it was a little bit of a jump. I worked as a mate on Gleam, and then ran the business (Seascope Yacht Charters) for the two 12 Metres, Gleam and Northern Light, and Mariner, a 1950, 16.4 metre John Alden yawl. 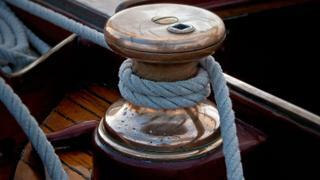 Bob had a passion for antique wooden boats and it was infectious; I caught the disease. The two of us restored Pam, an 18.9 metre classic commuter yacht built in 1921 that he spotted in one of those PennySaver magazines. She was half sunk in the river in Fort Lauderdale, but it was love at first sight. She was built for Hiram Walker, owner of the distillery that made Canadian Club during Prohibition. We removed some tanks – all I can say is they were not for fuel and they were not for water! I like her naughtiness. Gleam is 20.7 metres and was built in 1937 and Northern Light is 21.3 metres, built in 1938. Both were trial horses in the America’s Cup in 1958 and 1962. Sailing on a 12 Metre is something you will never forget; the power is unbelievable. The smell of a wooden boat, particularly below, is distinctive. If you blindfolded me and took a pillow off of Gleam, a pillow off of Northern Light and a pillow off of Pam, I could tell you where each came from. It’s almost mystical; it’s as if you can feel the spirit of the wood in the pre-war craftsmanship. Bob and I were together for 15 years before he passed away. I did have a moment of indecision about keeping the boats, but I wanted to do right by his name and his legacy. After Bob passed, the crew convinced me to race Northern Light and we won with five bullets, five first-place finishes. I trimmed the main in all the races. When Bob was alive, I would always do the main or the running back stays. He always said it was the most important job on the boat because you had to keep the rig up, but I think it was a selfish thing because he wanted me near him. 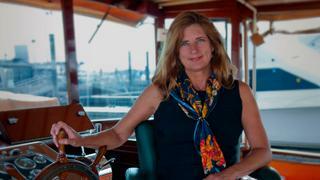 We would take Mariner to Nantucket or the Vineyard, or run over to Block Island on Pam for dinner. Lane, my husband, and I now have a 9.7 metre Wasque lobster boat called ZigZag. 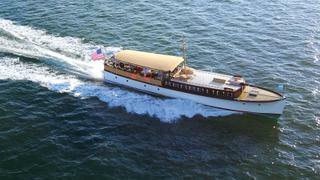 We also have L’Allegro, an 18.9 metre 1918 Lawley-built express cruiser in need of a restoration. But now it is time to travel on our land yacht, a converted Mercedes Sprinter. It’s been almost 28 years and I want a simpler life – the boats are now for sale.